Should have ridden this morning, ‘Cause it’s going to be down in the single digits tomorrow morning. The run has been exceptional over the last week. Mild temperatures and good legs have kept me happy and on the road. The bike, not so much, but ‘salrite, ’cause everyone needs a break now and again. Best run of the holiday week was Friday with my lovely bride. We’d headed up to Manchester, Vermont without kids. Original thought was to get in some cross-country skiing, which is tough with the boyos, especially after they’ve seen downhill. But, Mother Nature’s been gentle this winter after blasting us with Irene and the October Snowmageddon. Stayed at the lovely Inn at Manchester, ate Thai food downtown, and walked arm-in-arm through a shopping mecca realizing that there wasn’t really anything we needed. I bought socks, though – made in America and 100% wool. 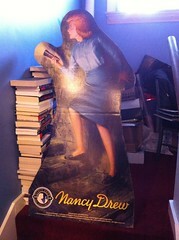 And we both dug the Northshire Bookstore, though I was crestfallen that I couldn’t score the lifesize Nancy Drew cutout for bosmon after her brilliant series reading and reviewing ALL of the original ND mysteries. We set out about 8, no particlar route in mind, and not sure how the legs would feel after a week of eating and drinking. But as the snow flakes tumbled down, and the joys of running the false flats of the Battenkill valley sunk in, we decided to to the loop around town, which ended up being not quite 7 miles. There was a moment of tension about mile 5 when we hadn’t quite made it back to town, and Missy threatened to strap me to the rocket sculpture in one of the town parks, but I managed to bluff for another half mile and we were back on a stretch of road she recognized. No speed records were set. Finished up with the half mile of marble sidewalk in front of the Orvis store, confirming a suspicion I’ve held for about a decade that they’ve stopped being a sporting goods store and are now merely a means for separating moneyed fools from their dollars. Marble and snow make a great lubricant, as well as looking spectacular. Best part about staying at a bed and breakfast is the breakfast – cottage cakes, which are kind of panckaes, ‘cept light on the flour and heavy on the cottage cheese and egg, and sausage. Missy didn’t want sausage, so *score* – more for me. I’m starting 2012 in a good place – not where i want to be weight-wise, but happy where I am fitness- and injury-wise. It’s great to be able to bang out 5+ without thinking, and I’ve got a solid group of folks with whom to run or bike when I want company. Life is good. Great post Billy. Glad to hear your happiness! Also glad you enjoyed Vermont. Missing you four!